We have no doubt that Mr Cox, of Clarendon, would be most willing to allow the young fish to be placed in the natural pond at Strathmore (a Cox property adjoining Clarendon) already referred to, which is so admirably adapted to the purpose. By 1868 Clarendon was one of several northern locations to receive trout ova from Plenty, as a base from which to stock local rivers. Further generations of the Cox and Youl families maintained a strong interest in angling on the South Esk, allowing access to the river through their properties. Mr Cox kindly gave us permission to pitch our tent at the bottom of his garden, behind a hawthorn hedge with weeping willows intermixed, which formed a beautiful shelter from a pretty stiff NW wind which is nearly always blowing there. After getting everything comfortably settled we all commenced fishing from the ford and got down as far as Mr Youl’s but the evening was very cold and unsettled looking…However, to return, I was the only member to catch a fish the first evening, getting one just 2 lb. The fishery had its share of problems. In 1889 there was newspaper correspondence about the destructive effect of cormorants on the native and introduced fish. 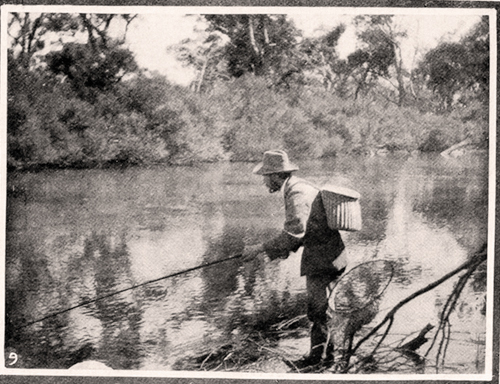 By 1906 J. C. Cox and C. A. Youl were active on a committee formed to consider damage to the farming industry and recreational fishing by mining activities further upstream in the South Esk River.